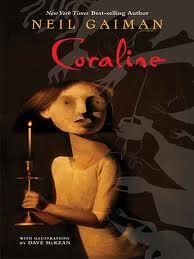 Coraline, an only child, lives in a flat with her mother and father, who are usually busy. Coraline discovers a door that connects to the other flat. When she figures out how to get over to the other side, she discovers some similarities and some differences compared to her side. Even the “people” resemble her family. Making her way back, if she can, will require facing darkness, desires, and fear. Parvana lives in Afghanistan, with her well-educated family. Unfortunately, the Taliban have control over the city where Parvana lives. Her family has had to move out of their nice home, and now live in a small room with barely enough food, and no water. The Taliban use violence and fear to control everything. They have even called off school! As the Taliban hurts Parvana’s family directly, she has to be brave and do some things that she never would have imagined. 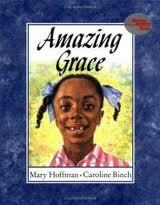 Grace is an amazing girl, who can do all kinds of things. She decides that she want s to be Peter Pan in the school play. Someone tells her that she can’t because Peter is a boy. Someone else tells her that Peter is not black. Fortunately, Grace has an amazing Nana who knows just what to do! 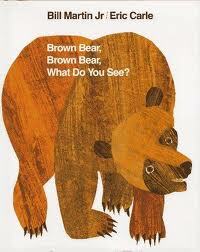 Repetitive patterns and familiar animals make this book a fun way to read, learn about colors, and play with words. 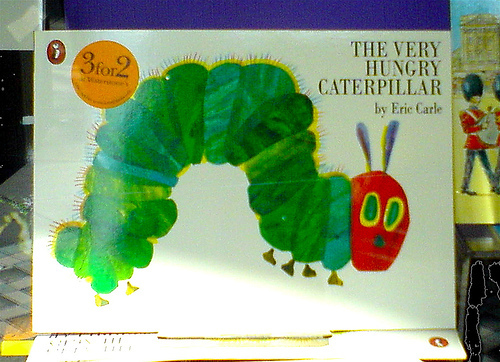 This artistically crafted book tells the tale of a hungry caterpillar who eats his way through many things. Children have fun counting, and finding out what happens after he ate enough to cause a stomachache. Funny pictures fill the pages as David gets in trouble and is told “No.” This book was based on a book that the author wrote when he was young, but he has added a nice ending. 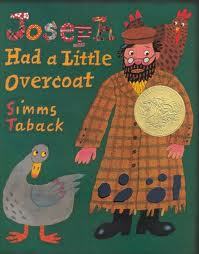 Based on an old Yiddish folk song, this book tells the tale of Joseph’s overcoat, and what Joseph does when it wears out. Beautiful illustrations tell the beautiful tale of a boys love for America (California in particular) and Japan. 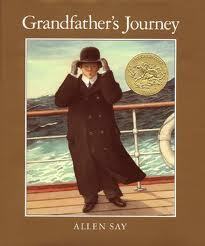 The love for both countries was inspired by his grandfather’s travels. Life is challenging enough for anybody who is about to turn 13, but for Mibs Beaumont, turning 13 changes everything. Every Beaumont has a “savvy” or a special talent that starts on the 13th birthday. One Beaumont can control electricity, and one can create huge storms and hurricanes. Mibs convinces herself that her savvy can wake up her dad, who is hospitalized in a coma. When she gets on a bus to sneak to the hospital, she and her siblings end up on quite the adventure. Joey gets to spend the summer with his dad who convinces (forces) Joey to stop taking his ADHD medications. 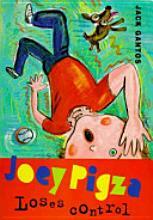 As Joey loses control of himself, he also has to come to terms with some other difficult issues: his parents’ divorce, his dad’s alcoholism, and his grandmother’s addiction. This story is a story of a mouse, Desperaux, who is not content with his lot in life. He is a dreamer, and falls in love with a princess, named Pea. As Desperaux fights for a life that is more than what he was offered he has to confront rejection, fear, darkness, and the rats in the dungeon. 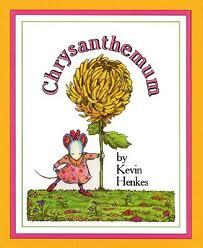 Chrysanthemum is anxious to go to school for the first time ever. When she gets there, all of the girls make fun of her name. Chrysanthemum’s parents support her, but make her keep going to school, where she learns about much more than just reading and writing. 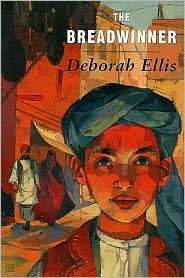 This book is as much artwork as it is a story. In the story, the reader passes through the country, and into the city, visiting many places. 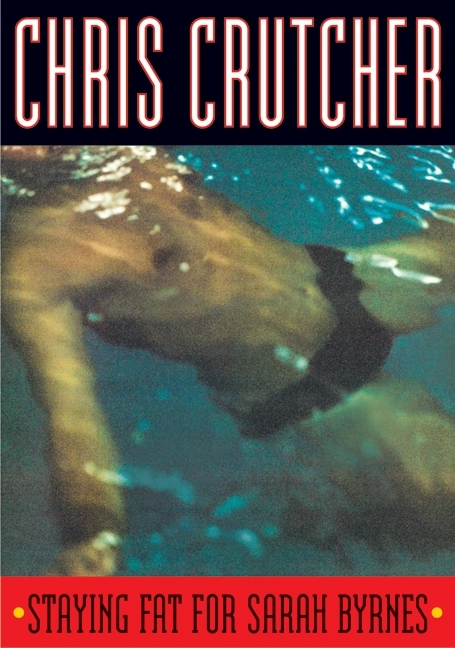 When the book is flipped, the reader takes the trip back, viewing the pictures from a different, yet brilliant point of view. Ginny loved school and books, but was sometimes clumsy and saw things in twos. When she was tested by an eye-doctor, he discovers that Ginny has double vision. 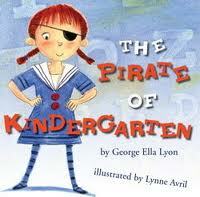 She handles the treatment well, and becomes the pirate of kindergarten. 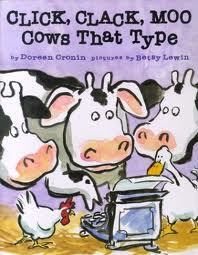 Farmer Brown has all kinds of trouble when his cows get hold of a typewriter. They started typing out demands and going on strike. Farmer Brown might be able to outsmart them, but will his troubles really be over? Anybody who knows Wallace Wallace knows that he can’t lie. He just can’t do it. When Mr. Fogelman has Wallace write a book report on Old Shep, My Pal, Wallace says he hates the book (remember, he can only tell the truth). Wallace explains that any book with a dog on the cover results in death for the dog. Unfortunately, Mr. Fogelman loves Old Shep, My Pal and Wallace ends up in detention. While serving the detention (weeks and weeks of detention), Wallace makes some suggestions on how to improve the school play (Old Shep, My Pal), learn some things about friendship, and help Mr. Fogelman learn some things too. In the year 2140, Surplus Anna lives in Grange Hall with other unwanted children. Children are considered thieves, as the Legals are entitled grown-ups thriving on Longevity drugs. 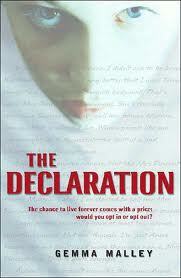 When the drugs became available, decades before, humans had to sign the Declaration, promising to not have children. 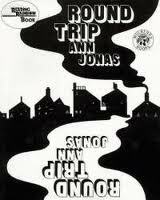 While at Grange Hall, Anna is told that she should not exist, and is told that her parents were criminals. When Peter shows up, however, Anna is forced to question things (including authority), and is faced with some decisions that may compromise her safety, her life, and the lives of others. 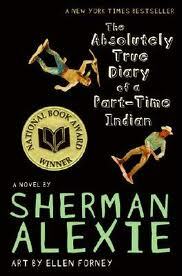 This blog will cover books that I have completed reading, and my rating of such. My intention is to enable students to find books they may enjoy. My other purpose is to remember some details about the books after I have read them, given that I am reading so many, so rapidly. When I list ages or grade ranges for the books, these are not reading levels. Reading levels do not account for interests and appropriateness for a given reader. For example, a ten-year-old who can read at a 12th grade reading level, should not be reading about affairs and politics just because he/she can. Likewise, and adult with a lower reading level is probably not interested in reading about a child’s kindergarten class.